I have to say that I am always attracted to books that help me be a better parent, a better me. I didn’t quite know what to expect from this book, but let me tell you I was NOT disappointed. Radun’s advice is insightful and right-on, helping moms achieve a healthy and balanced living no matter what their situation: stay-at-home mom, workaholic or something-in-between. I’m the something-in-between. Finding balance in one’s life is not easy. Sometimes I feel I’m doing great. But other times I’m so frazzled and overwhelmed I wonder what possessed me to think I could do all I set out to do. 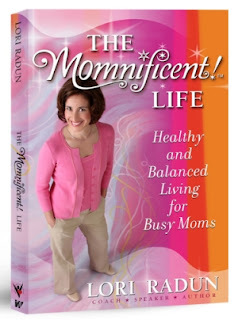 Reading The Momnificent Life was like a breath of fresh air, infusing me with positive energy so that I felt motivated and confident I could truly accomplish what I want to do. I was surprised to see how complete this book is with information and valuable advice on practically every topic a mom faces today. Radun effortlessly tackles eight components to living a momnificent life: Personal Development, Spirituality, Fun and Enjoyment, Relationships, Health and Aging, Personal Finance, Career and Profession, and Home and Family. Firstly, Radun shows you how to analyze your own life by helping you assess the current balance and satisfaction of these eight areas of your life. This is an important step and exercise because you get to see at a glance the overall picture of how you’re doing and helps you identify your strengths and weaknesses and what areas of your life you want to work on. In other words, this book enables you to create a unique life based on your individual goals, values and psychological needs. You get to decide what you need and want to change for a better quality of life. Remember the book Organizing from the Inside Out by Julie Morgenstern, where the organization in tailored to one’s personal lifestyle and needs? Well, this book is the same. And I love reading it. Let me further tell you why. Once I saw where I needed and wanted to make changes, I focused on those areas and turned to read those chapters and … got inspired! Yes, Radun’s voice is clear, positive and inspirational. I can see her experience as a life coach shining through the pages because I felt she was right alongside me, tugging my hand gently. At the end of each chapter, Radun leaves you with an assignment. They’re worth it. But this is not a book you can read and put down. It’s a reference and workbook that will be useful at different times in one’s life. I think this book is a gem. It’s chock-full of practical information, easy-to-read, motivating, and inspirational. Best of all, it helps you be the best you. Highly recommended for ALL moms! For more information visit www.momnificent.com. Disclosure: Thanks to Lori Radun and ReviewTheBook.com for sending me this book for review. I was not compensated in any other way, nor told how to rate or review this product.